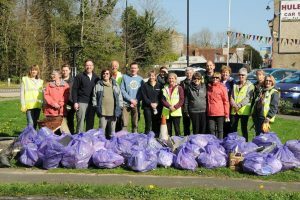 There was an impressive haul from the litter pick on Sunday 24th March. We collected 46 bags of rubbish, plus numerous road cones, two tyres (including a metal reinforced one) a drill, electric fan and a four piece dinner service. That takes the total this year to 68 bags and the total since records began in November 2011 to 718, plus the various extras, on one occasion a kitchen sink. The 20 volunteers were rewarded with breakfast in the Purbrook Cafe on completion.